We've entered the last few days of campaigning in the Uplands council by-election. It's been both a frustrating and an enjoyable few weeks. Frustrating because we haven't been able to discuss our ideas fully with everyone in the ward. The local media has pretty much ignored the election; one reporter phoned my agent, Alec, to ask when the election is taking place! Trade Unionist and Socialist Coalition (TUSC) supporters stand in elections because we think that the working class need representatives who will fight for them. Even more importantly, we aim to show that there is an alternative to the cuts consensus of all the other parties. 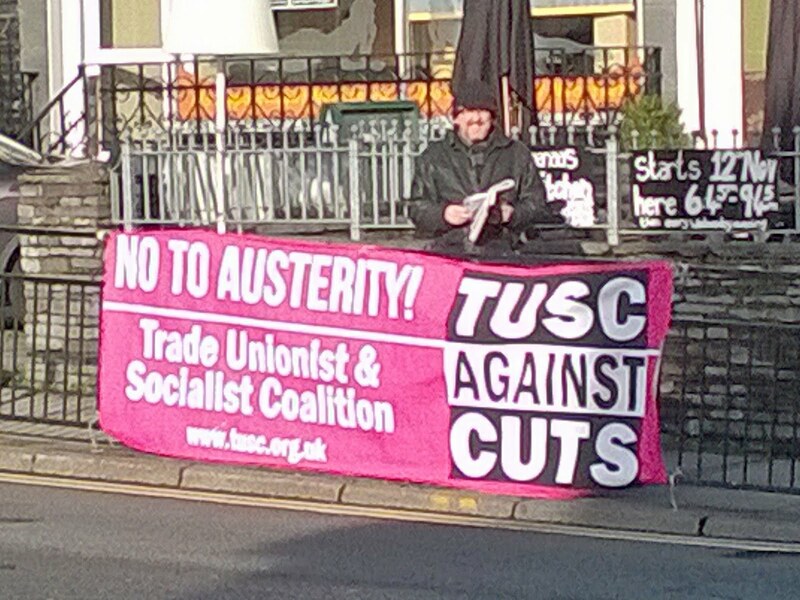 TUSC supporters are, as our banner suggests, campaigners and ordinary people who are united by basic trade union principles and socialist ideas. We do not have the huge financial resources of some of our opponents, who promote one brand of austerity and cuts over another. The only way we have to overcome this disadvantage is by talking with and convincing people through discussion. This is the enjoyable part of any election campaign. In particular, I've particularly enjoyed Saturdays leafleting and talking to people around Uplands Square. We've had a friendly and receptive response. We've discussed with council workers who've seen their incomes frozen or cut or their jobs under threat and with people who are seeing services that they, or other family members rely on, cut or threatened. There's enormous anger that halfway through the Labour administration's term in charge of running the Council, the pace of cuts to jobs and services is accelerating. Just how many votes for TUSC that anger will be translated into on Thursday remains to be seen. People have been let down so many times that many won't even vote. If we win though, then for the first time, Swansea will have a councillor willing to stand up and say "no" to austerity. Voters have an opportunity to achieve something historic rather than making cuts with "a heavy heart" (and a nice allowance cheque). Either way though we have put down a marker for the future. TUSC plans to stand 1000 candidates in the English council elections in May and 100 candidates in parliamentary seats in the general election. Uplands voters will have another chance to vote TUSC in May because Swansea West is one of those 100 seats we aim to stand in. 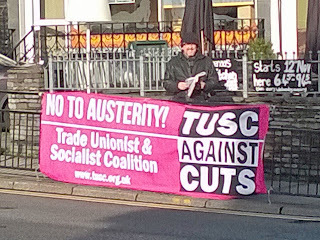 And where do TUSC supporters go between elections? We continue arguing the case for socialism and fighting cuts in our workplaces, unions and communities. Members of my union, UNISON, have just provided a mandate to ballot for strike action over pay in Welsh colleges because we've been offered no cost of living increase. We're the activists in your trade union branch. We're the people highlighting low-paying employers and those using zero-hours contracts. We're the people protesting at attempts to close down services. If you're fighting cuts then we're the people alongside you. If you want to be part of building a socialist alternative, give us a vote on Thursday - vote Ronnie Job, TUSC Against Cuts - then join with us in building TUSC as a real voice for trade unionists, workers and all those opposed to cuts.